The aim of this ongoing series of posts about the various #coursedata demonstrator applications is to give an overview of the different ways a standardised course data feed can be used. One of the use cases voiced when we were commissioning demonstration applications was that they might allow someone in a bus Queue in Bangalore to find a course. Whilst the CoMoBo app is possibly more parochial, it builds on existing Mobile technology, and certainly allows a bicyclist in Banbury to find a course, and register upon it. The demonstrator harvests XCRI-CAP data from Oxford Open Data (and potentially other sources in the future) and allows mobile devices to request data through an API. Built on a stack of Open Source code from OxCRI, Erewhon and OxCAP projects, It displays a searchable geo-sensitive course directory to students. This is important in Oxford which has more graduate students than it does undergraduates, and offers a very large number of training courses, by departments, divisional offices and Doctoral Training Centres. The Oxford University Student Union (OUSU) 2011 Report on behalf of Post-Graduate Taught Students highlighted the need to make it easier for these students to access information about training opportunities and to enrol for places. 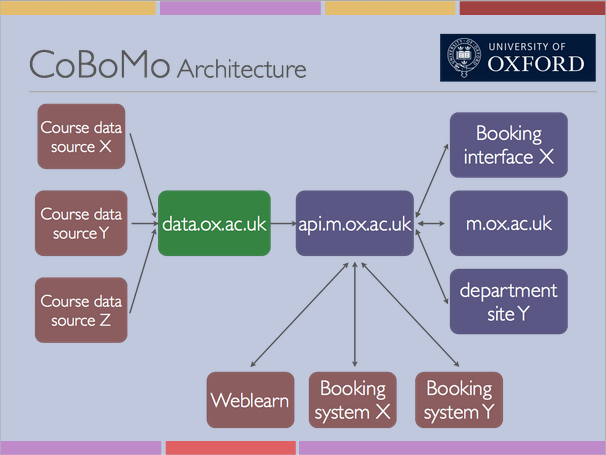 Posted by robwork on February 13, 2013 in Course Data and tagged CoMoBo, Course Data, mobile, Molly, Oxford, XCRI-CAP.